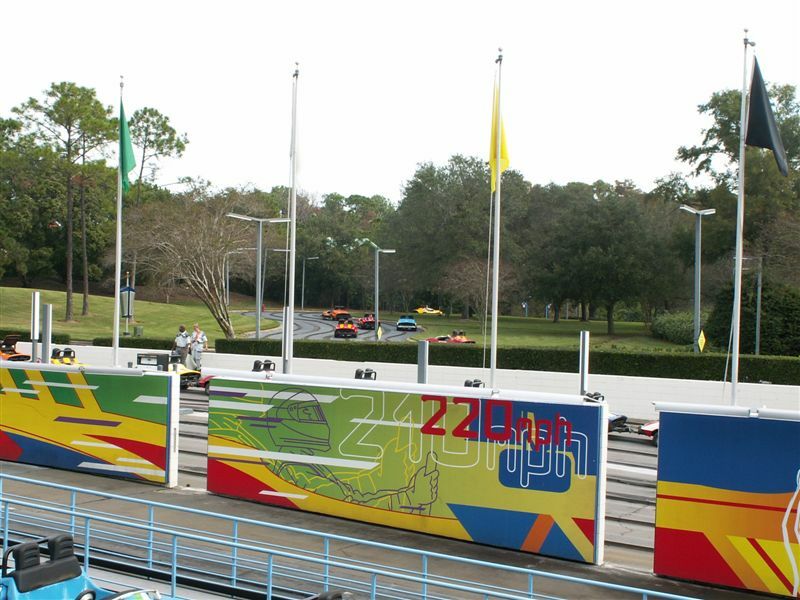 I wanted to take a few pictures of the Speedway, and particularly to check out the views from the grandstand of the raceway, if you're not familiar with the Tomorrowland Indy Speedway has a seating area that faces the load/ unload area and looks out over Tomorrowland as well, you can also get a decent view of Space Mountain from here, though of course, the flags from the raceway will be in the view as well. 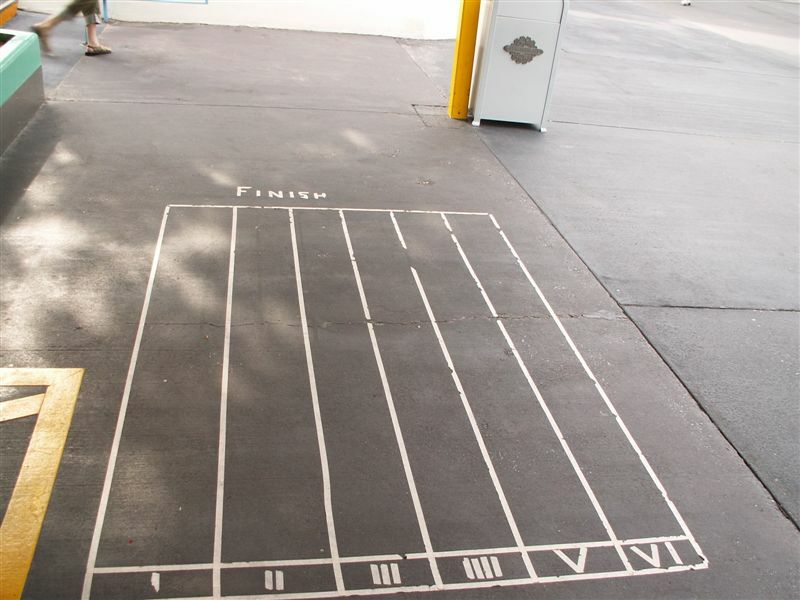 When I saw these tape marks on the ground just outside the raceway, I didn't recall just what these are for, (though I realized later I had heard this mentioned on a podcast Inside The Magic I think), obviously being at the speedway this is for a race, so I asked the cast member standing nearby (at the entrance) about it, and he was kind enough to show me what it was for, he checked behind a nearby door and found a few toy cars, these cars were a Doc Hudson, and a Lightning Mc Queen from Disney's movie CARS. 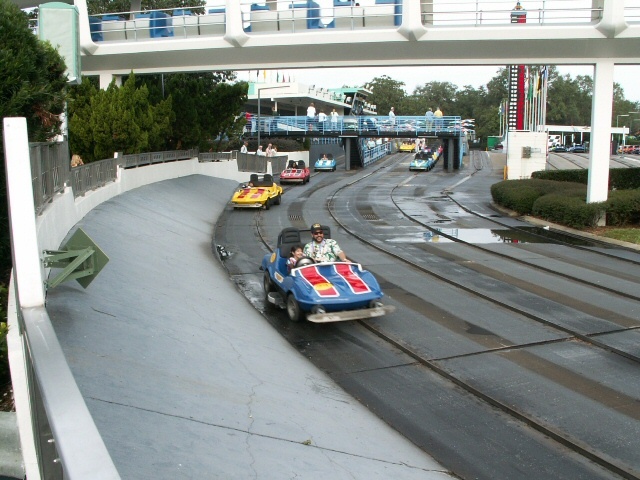 Not only did he show them to me but he pulled them out and we raced. Below is video I took to view on it click it twice the first time activates the controls the second click actually plays it, it appears that a third click opens the same video, only on the youtube site in a new window or new tab. The first fifteen seconds or so nothing happens this is because you have to "shake the cars up" to get them going, and we were doing that off camera. 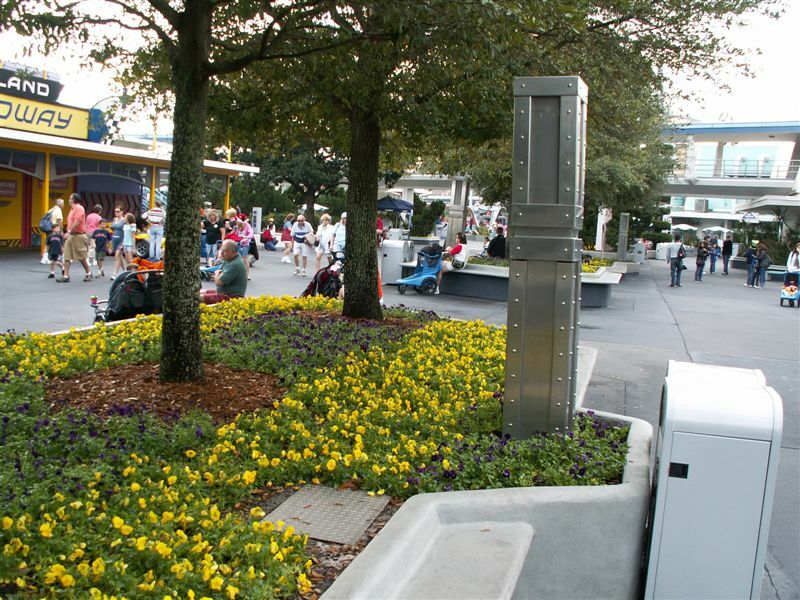 In the picture above you can see one of the speaker boxes from which the Tomorrowland background music plays. 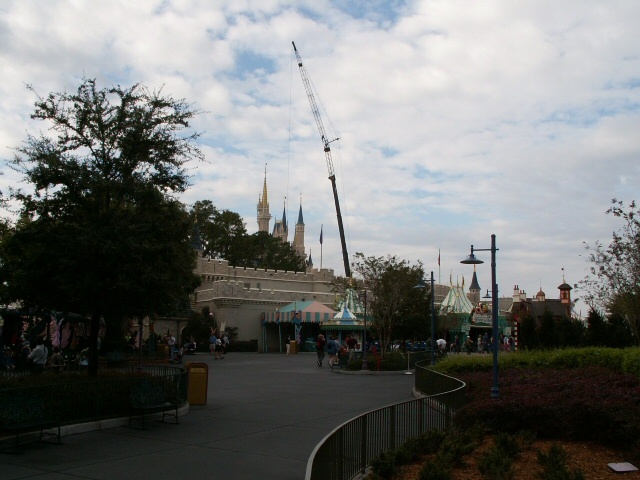 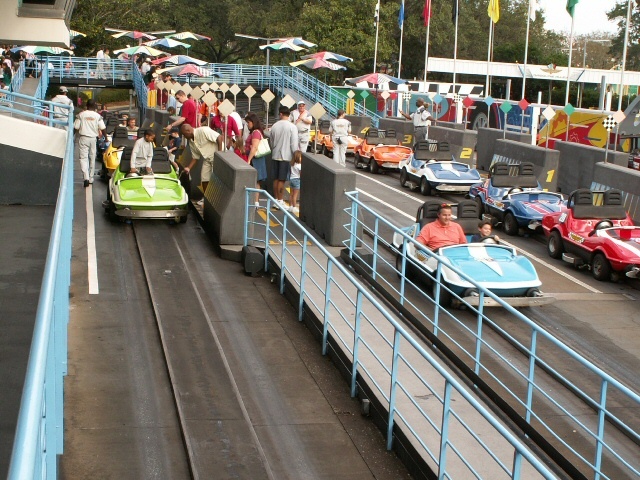 The music at the Magic Kingdom seems to be the same as that in Disneyland's Tomorrowland which played in episode six of my podcast http://media.libsyn.com/media/bbdp/bbdp2006-06.mp3. Also in the shot above you can see some of the plantings, not necessarily themed ones, just some pretty flowers, and some trees that probably just help soften the landscape in this area which is a sort of transition area between lands, the shot below shows some on the more themed landscapes some topiary trimmed in a Tomorrowland style. 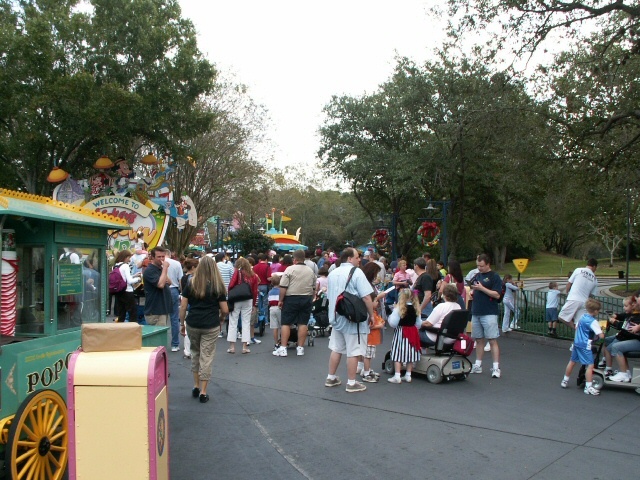 As I neared Mickey's Toontown Fair I noticed that it wasn't open yet, but quite a few folks were lined up waiting for it to open, I didn't want to get in the crush of the crowd, but it was only a few minutes until Toontown was to open, so I decided to wait for that, I stood off to the side near a vending cart and listened to the BGM ( BackGround Music ) which in this spot was all Pooh related tunes as the planting berm behind the cart is the boundary to the Pooh play area, which is also across from the Pooh dark ride making this end of Fantasyland a sort of Pooh themed area. 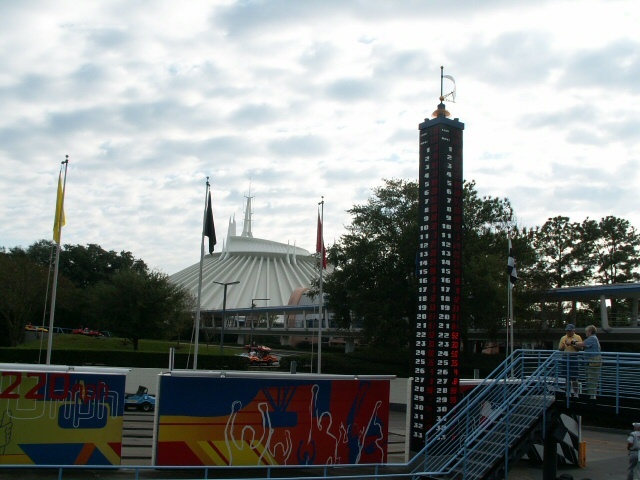 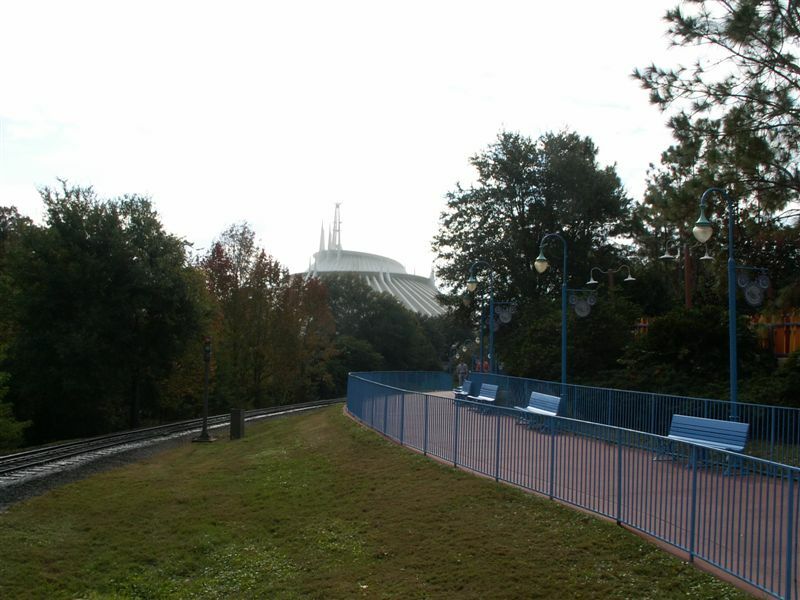 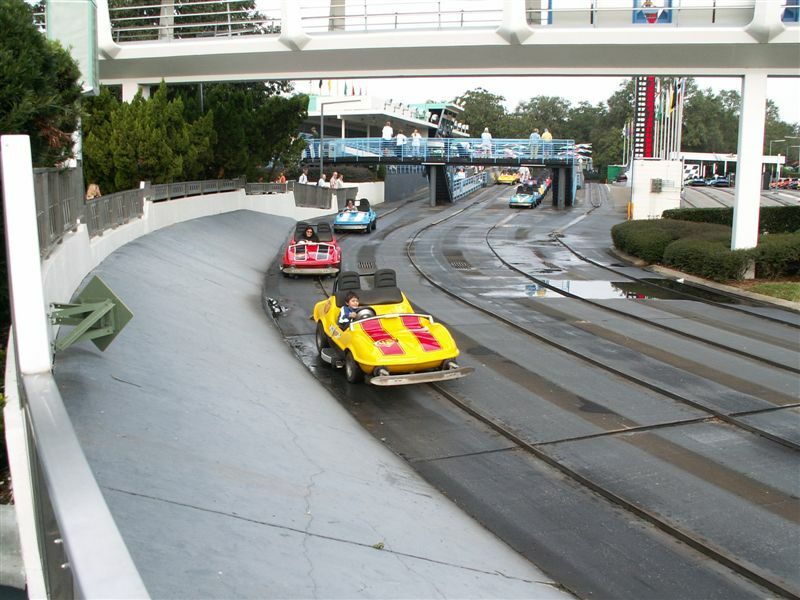 Directly across from where I waited you could see the Tomorrowland Indy Speedway. 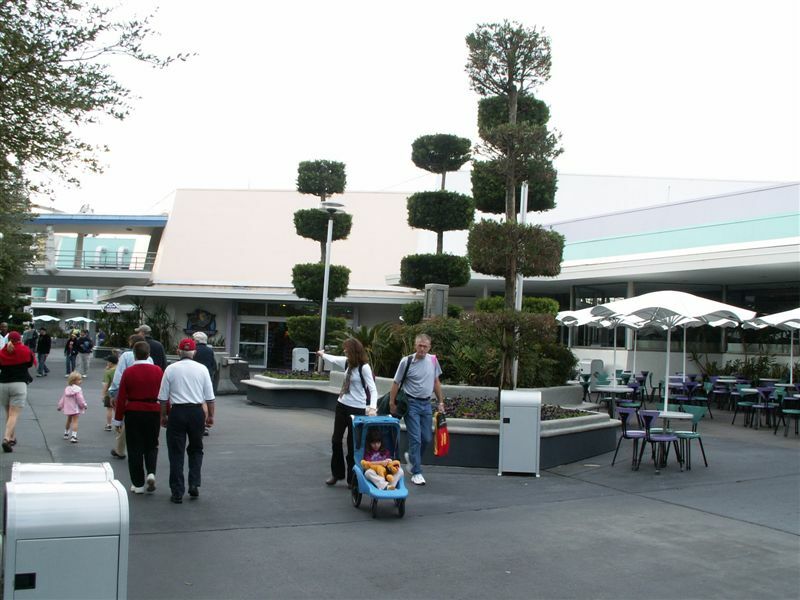 In the shot below you can see the transition between the railing for Tomorrowland ( grey, on the right ), and Fantasyland ( Green, on the left ), the large trees and bushes help screen Tomorrowland from Toontown Fair and Fantasyland. In the shot looking towards the Pooh ride, you can see a part of the planter I was standing next to, the planter is in the right hand edge of the shot. 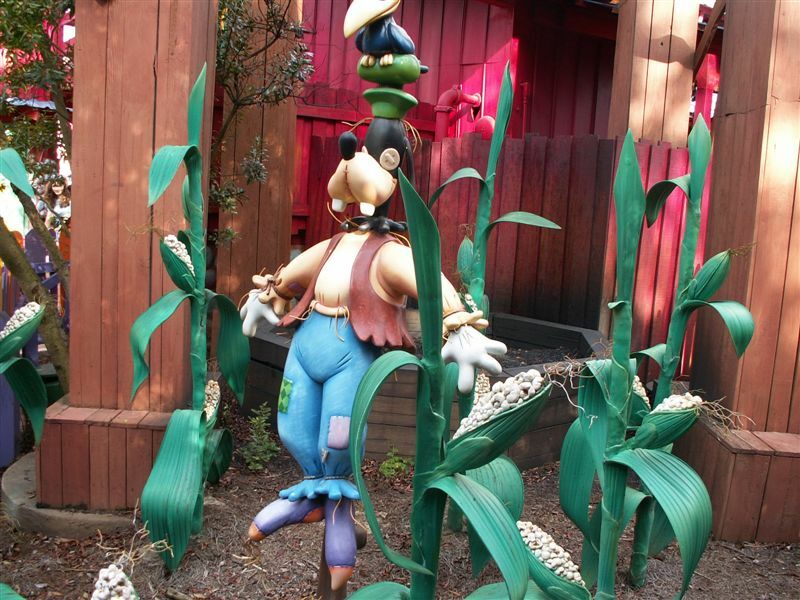 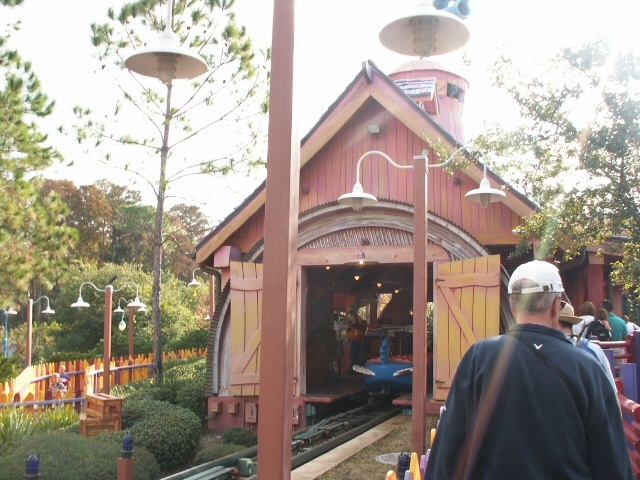 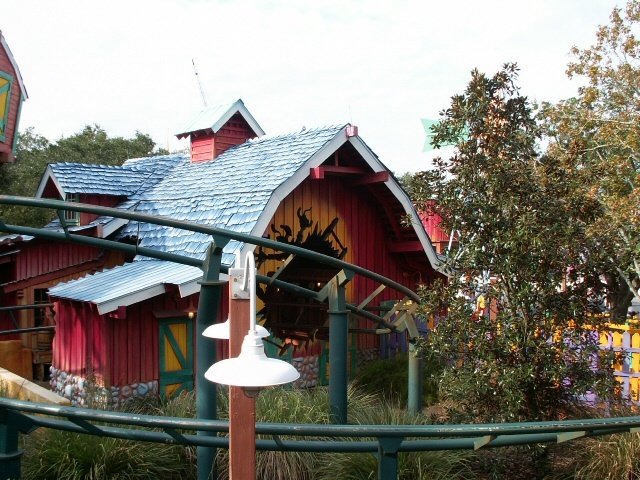 I decided to ride the Barnstormer since I never had before and I knew this would be the shortest line it would have all day, it's a cute ride and the queue looks well themed too, I particularly liked the scarecrow Goofy. 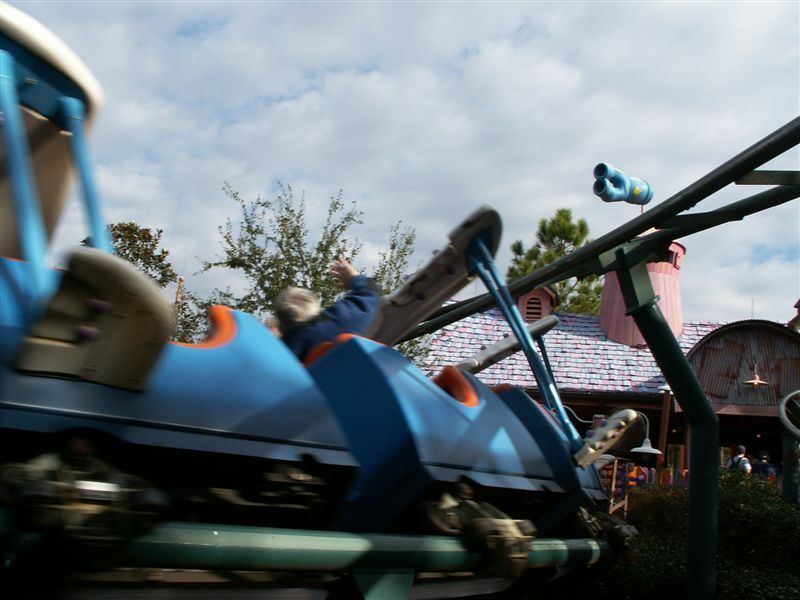 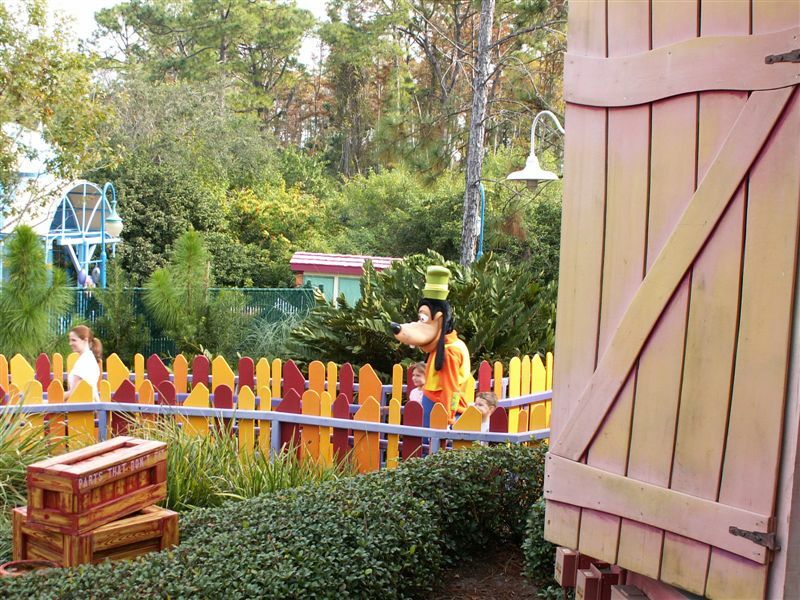 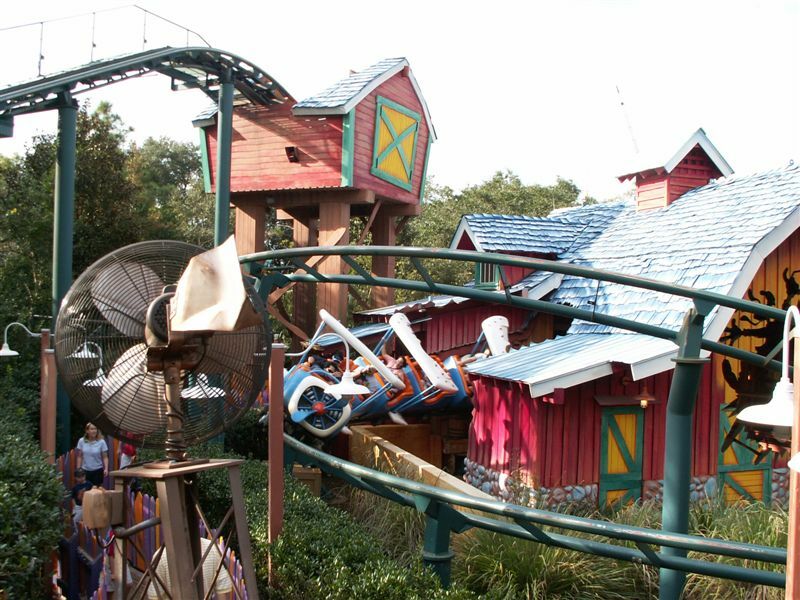 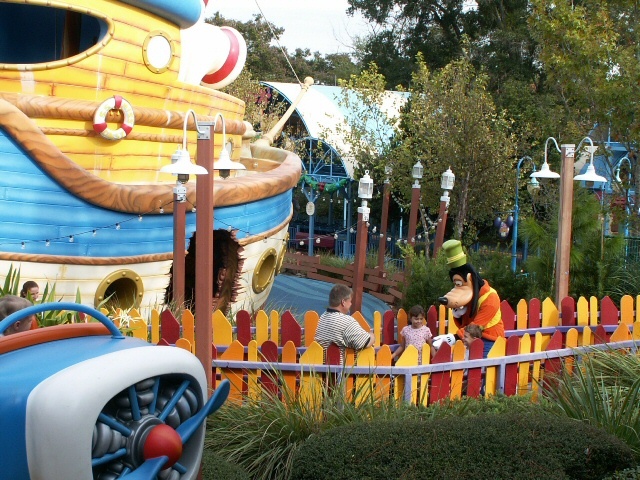 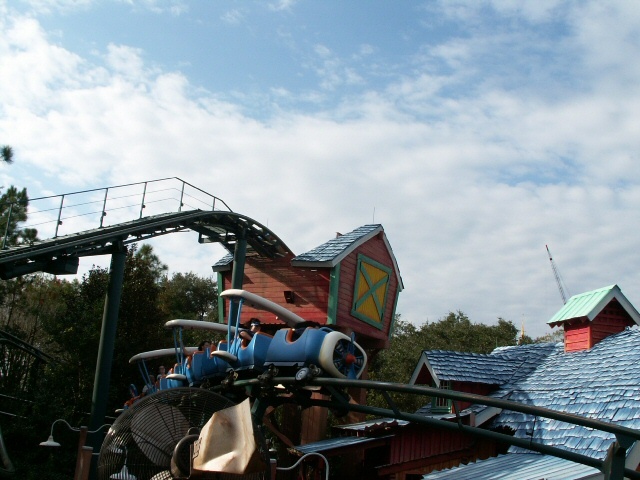 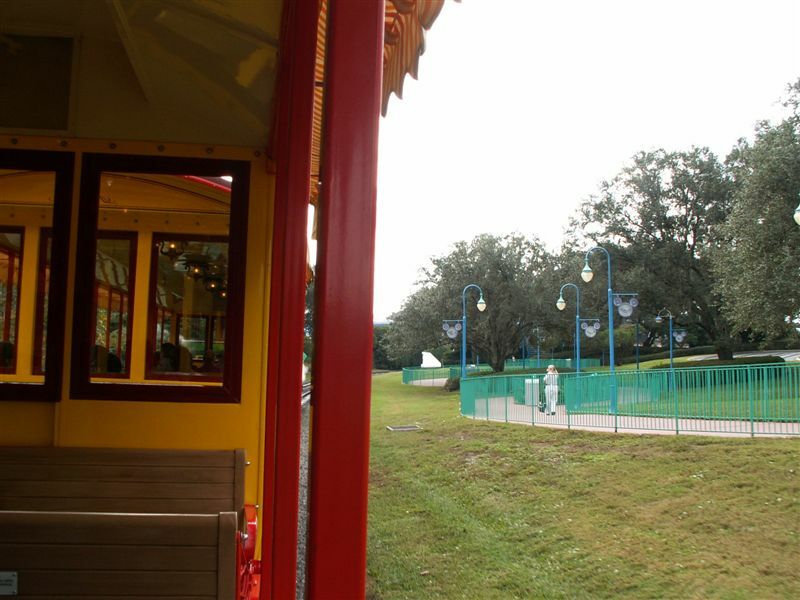 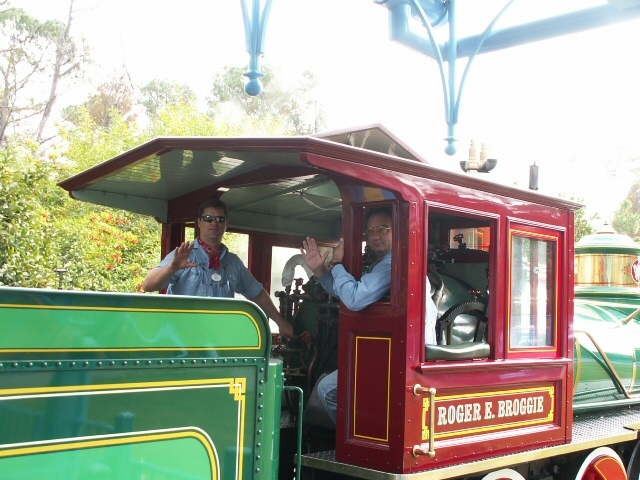 In the two shots below you can see Goofy getting off the train, hey, if you had your own coaster in the parks wouldn't you ride it first thing every morning! When I got up front I got a special treat of my own I got the front row, so I pulled out the camera and put it into movie mode and *thought* I pressed the button to record, unfortunately I must not have pressed it hard enough as when I got to the end I realized I didn't have a movie of the ride... bummer, that could've been a good one. 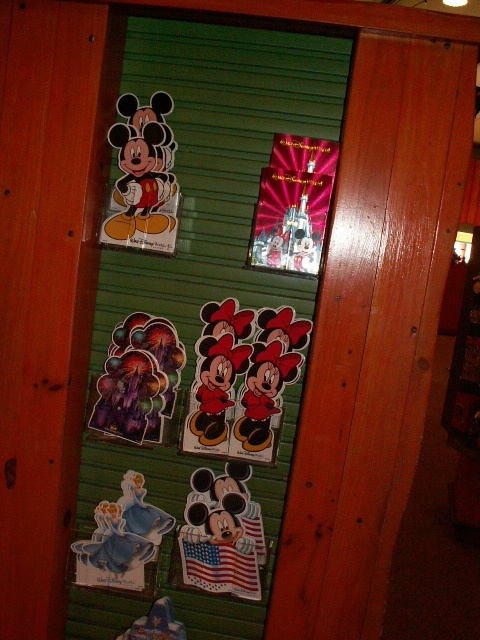 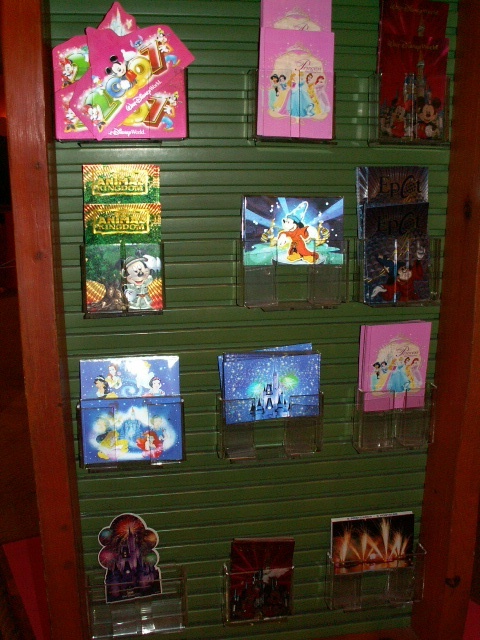 After riding the Barnstormer I did one of the things I most wanted to do in this land, I visited what was probably the only gift shop in the park I had never visited before County Bounty, and since it was still one of the first postcard shop visits of the trip I actually got several new cards; A 2007 Lenticular fab4 plus Stitch die cut, a new Princess lenticular, and several new character die cuts, now if these character die cuts don't look new it's because very similar cards appeared previously, only they were much larger. 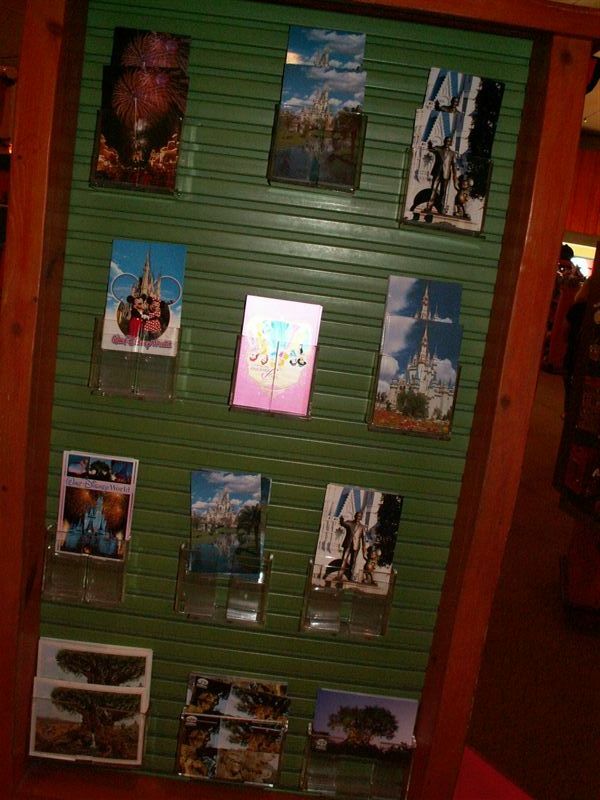 One thing I like about taking pictures of the postcard racks is it shows which cards of the old views are still available. 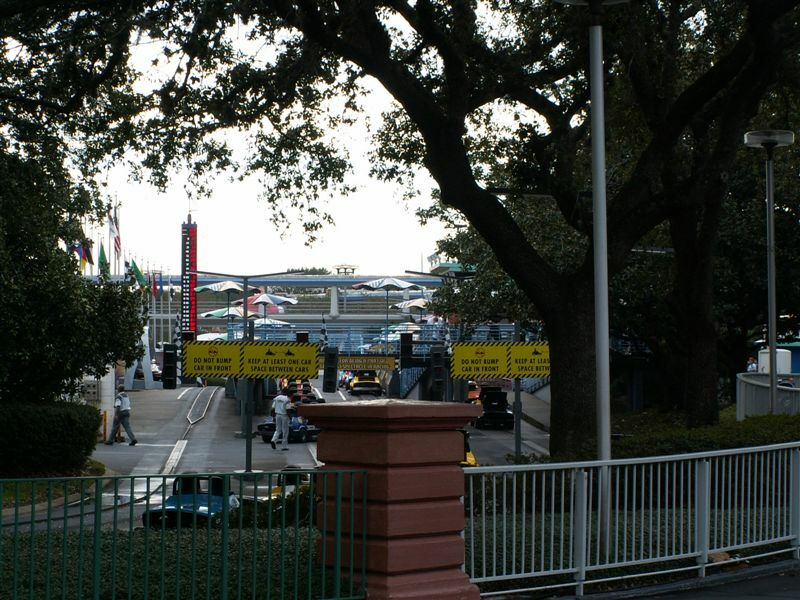 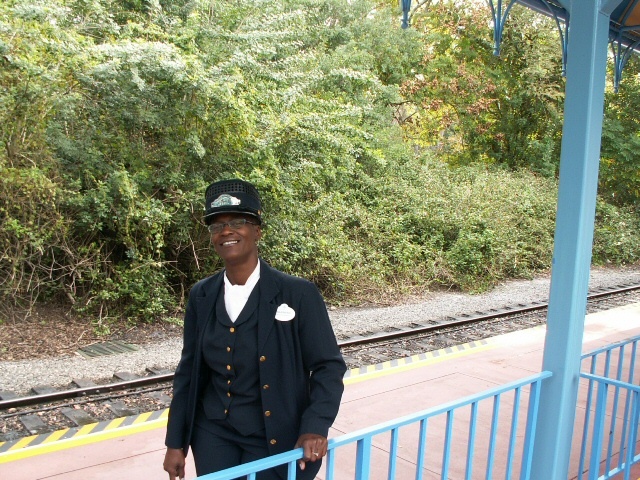 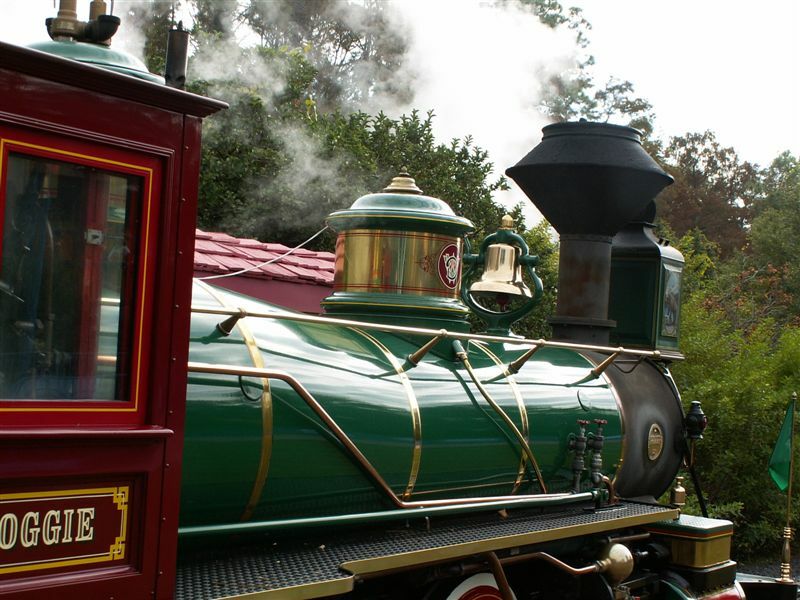 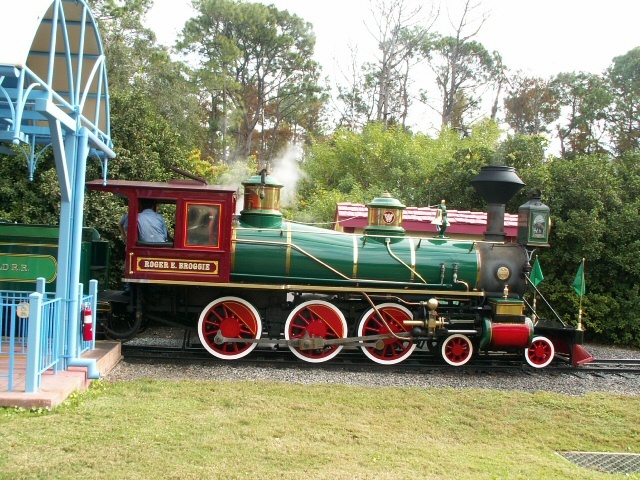 I had checked out the train station when I was on Main Street U.S.A., but it wasn't running yet at that time. 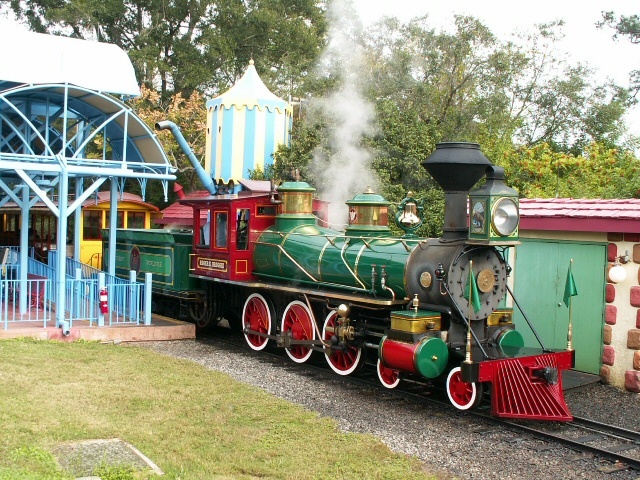 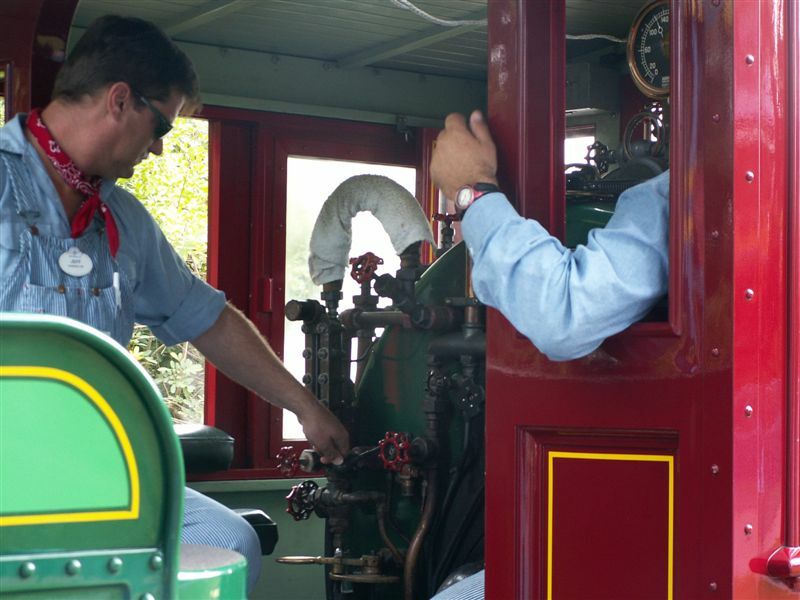 After that, every time I heard the train whistle I kept wanting to go see the trains so it's not surprising that after I got done in the shop I went to ride the train.